An article in The Guardian Cut Your Food Waste tells me that the amount of food we throw away in the UK is frightening. “The average UK household throws away 5kg of food a week – the equivalent of a whole chicken, garnished with 22 carrots and 11 potatoes, every week”. That kind of waste is wrong on all kinds of levels, from environmental to monetary. Organisations like Wrap have done a lot to inform, educate and publicise the issue and in turn The Guardian asks its readers what’s the best way to reduce our food waste? As a vegetable grower I can dream that if more people tried growing just a few veggies then the realisation of how much work and effort goes into growing our food would lead to less waste. Imagine the scenario where you’ve lovingly grown and tended your veggie patch what’s the last thing that would happen, that you pick your salads, peas and beans shove them in the fridge and then promptly forget about them only later to throw them away? Of course not, you use them as soon as you pick them, they are special, and they taste amazing. For the majority growing a few veggies is beyond reach and the best option to reduce food waste is according to Wrap “planning, portioning, storage, date labels, and leftovers”. The food industry is looking at ways to reduce the rubbish… but only yesterday in my local Morrisons I saw double bags of salads being sold as “special” offers, it seems we have a way to go. While the food industry continues to find more ways to sell more to us we can look at how to use our food smart. 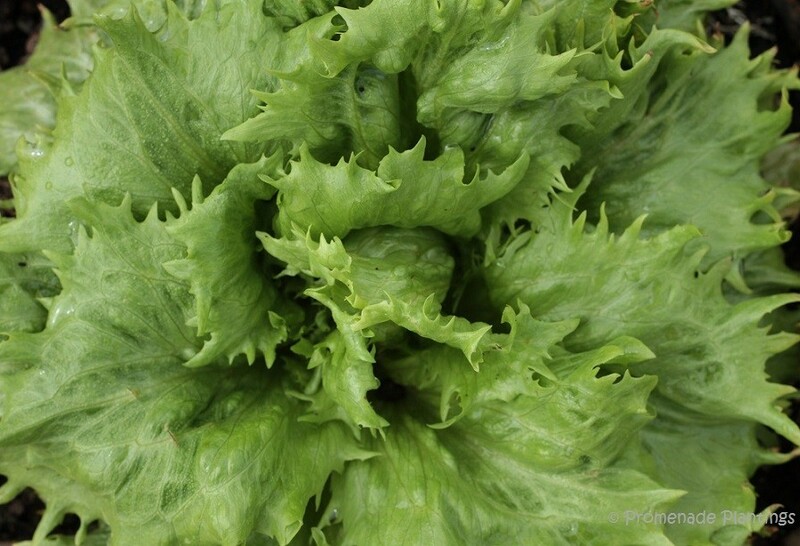 Lettuce soup is a start to smart food thinking. The original recipe calls for a greater proportion of potatoes and lettuce, I’ve adapted the quantities to suit me and my life, or rather a lonesome potato that needs using along with a lettuce and the remains of a bag of salad that were lurking in the bottom of the fridge. For those wondering, the weight of the lettuce and salad was 200g and the soup serves 4. Reading of Edith falling asleep after eating her lettuce soup reminded me of Beatrix Potter’s Flopsy Bunnies eating too much of Mr McGregor’s lettuce and falling into a deep sleep, for those interested in the sleep inducing qualities of lettuce I found a wonderful article on The Tangled Nest Soporific Salad and lettuce Opium – sweet dreams! It’s frustrating to throw food away isn’t it – knowing that only a day earlier you could have made a good meal from the thing lurking in the fridge! This is so interesting Claire. First, I’m loving this soup as I am indeed one of those people who ends up with spoiled lettuce, or more likely, arugula. I don’t throw it out, I put it in the compost, but even so more ends up there than eaten. I also have trouble sleeping deeply, so I’m going to follow your link and read more…and eat more lettuce for dinner, I think! I too compost most things Betsy, thankfully I’m able too! I do wish our local authorities would collect food waste separately so it could be composted at the municipal sites instead of going to landfill. What a nice recipe,for those few things I maybe can’t go through in time otherwise! Thank you, Claire! My pleasure Cindy! And of course making a batch of soup always means (for me) freezing some for another day…..
I’m good about not throwing away most things (monetary is the primary reason) but vegetables are a big weakness. I just don’t eat enough in my meals and then when I DO want so and look in the fridge vegetable drawer, the veggies (especially celery for some reason) have gone limp/bad so they get tossed. I wish we could buy celery in smaller batches, that way there would be a lot less waste, as I do the same as you – it ends up all soggy, I guess food planning is the “sensible” thing to do, but somehow life seems to intervene and befor eyou know it I have celery lurking in the bottom of the fridge! Food waste is a huge problem and my family does its’ fair share! I try my best to re-purpose leftovers and odd bits of this and that. Soups, stews, curries, stir-frys, burritos are in regular rotation but still, we toss out too much food! It is a constant job to poke about and make due with what we have! We are so spoiled, aren’t we? Definitely food for thought. I’ve been guilty of this as well. It spoils before we use it. Your post reminds me that I need to redouble my efforts. I think we need a reminder every now and then to look at our fridges, our budgets and our needs! 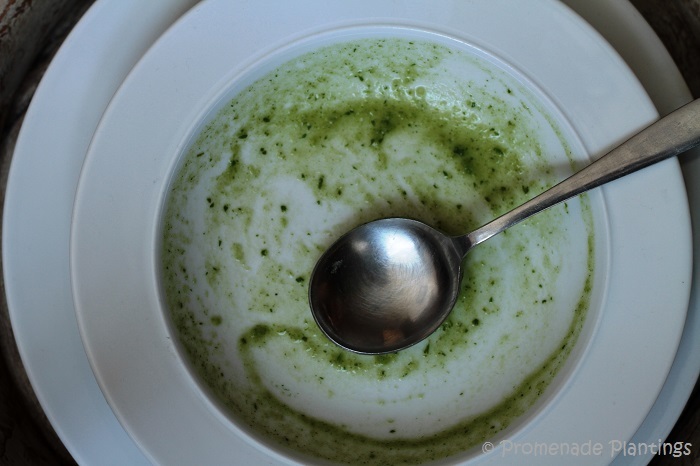 I first had lettuce soup at a friend’s – she didn’t tell me what it was but rather asked me what I thought it was…. Amazing! Agree, it is such a shame to throw away food. Avoiding supermarkets like the plague is a good start. Aren’t salad bags one of the worst marketing inventions ever? They’re even designed to start turning to green mush as soon as the bag is opened and those special, preservative gases are released. And even if all the leaves do get eaten, there’s still all that packaging… sorry, I’ll stop now! Your soup does look very good though, and a very tasty way to use up leftovers. Love this lettuce soup the colour is stunning! Shall certainly try your soup: it looks and I am certain tastes most moreish! I do buy those bags quite often as a large head of lettuce for usually just me keeps even less time and I always like to have baby spinach, arugula, Asian greens etc in hand. But eating stirfries at least every second day I find it quite easy to throw about a handful of whatever does not look so crisp any more into the pan about 30 secs before serving – no waste, extra food value!! Correctly repacked they do last that 2-3 extra days! I teach in a school garden and what I hear the most is “this is hard work!” I say to remember this feeling when you eat and don’t leave a morsel to waste. Also, I remind them to appreciate whoever is attending their garden. Happy Nesting. Hi Claire, you know by now how much I hate throwing out food. Good on you for finding a use for those leaves. This is a great recipe for those outer leaves that are not so great. My old, long dead, aunt used to cook the outer lettuce leaves but I have never done it. We really try not to have too much food waste and what we do have goes in the compost, but this soup sounds like a delicious way to use up lettuce! Will definitely try it, especially if it may help me sleep. Thanks Claire! It’s a frightening thought that the half punnet of strawberries chucked in the bin might have been flown in from Kenya. Our experience in Turkey taught us to waste very little food but even we struggle with bags of salad. What’s a boy (or girl) to do? Looks delicious. I love the color! I adore lettuce soup. Food waste is an issue that I’d like to explore more deeply. It’s horrifying really and what you are talking about is home waste. There is even more store waste. By the time the bags of salad arrive in the island supermarkets its definitely DOA (dead on arrival), so eating salad depends on me growing the leaves. Unfortunately my occasional mid-summer glut ends up on the compost, as I can’t give it away and we can only eat so much salad and green soup. Not only is the waste criminal, but also that people want to eat their salad pre-prepared and doused in chemicals, and have forgotten what to do with a real lettuce! It is indeed so sad about how much food is thrown away and how many people are starving. I have a good book called Economy Gastronony which is excellent and address many of these issues and gives good ideas for recycling food. Love this recipe – I often make this in summer when we have a glut of lettuce. I need to track down that book – it sounds like fascinating reading! I’ve never tried a lettuce soup. I’ve had lettuce in soup but that’s a different thing. I need to check this out later when the farmers markets open. Claire, there is a wonderful book by MFK Fisher titled How to Cook a Wolf, specifically written about stretching food during the war years. Recently, The Everlasting Meal by Tamar Adler has been written along similar lines, you might enjoy both. I know exactly what you mean by gardening changing your perspective – I dropped an egg once and had to go outside and apologise to the chickens! 🙂 Lovely soup recipe, thank you! I alway joke with my husband about our “garbage” meals. Delicious dinners made with leftovers from a previous meal or repurposing an ingredient. Nice post. It is amazing the amount of food that goes to waste in our world when there are so many others that do not have enough to eat. It is so funny that you wrote this post just as I was cleaning out the refrigerator. I am near mother hub bards standards right now and maybe we might have to have a condiment swirl for dinner. I also use lettuce in stirfrys and I feel it is a very underused veggie. Great little soup! Fantastic excerpts and stories from a wise woman indeed! We need to all be constantly mindful of our waste and how we respond to food packaging…it is a constant struggle but we must keep up the good fight…to coin a WWI phrase. Great post. Oh I adore watercress, and you’ve reminded me that a friend grew it last year – and boy was it tasty – so peppery you only needed a few leaves to give a salad a kick (or in this case a soup). it looses its fiery taste a little, but is delicious! Soup looks wonderful! Lettuce rejoice! 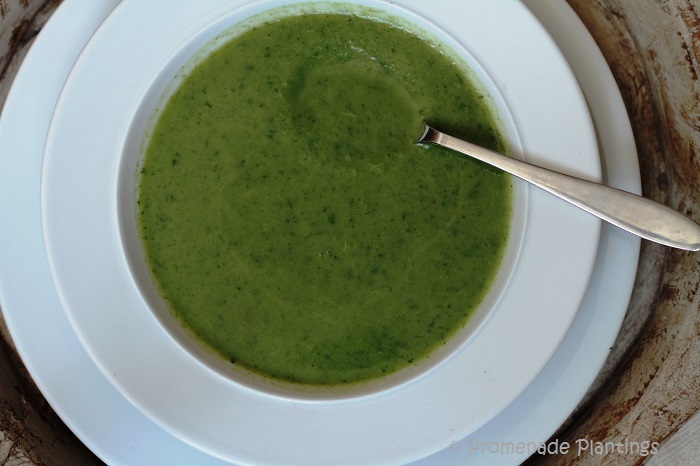 This is soup is really interesting – lettuce and potato – but of course we make soup on spinach. I would love a bowl of this soup with a nice piece of bread and some strong mature cheese. Love your photos, Claire. Yes, how terrible isn’t with all the food that we through away … daily. Same over here. 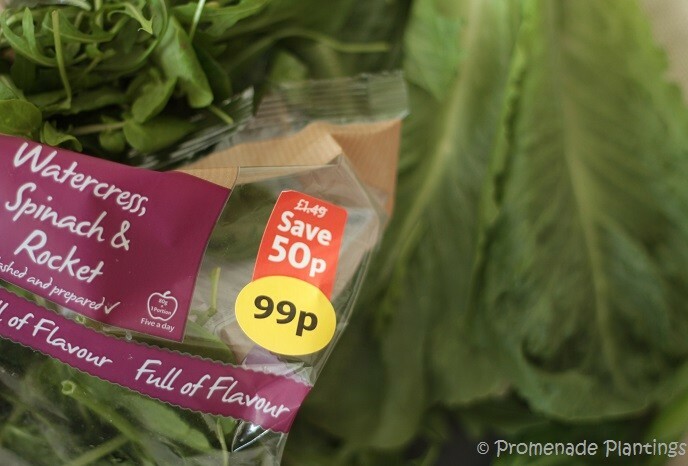 But shelve lift on lettuce in bag is so short when the bag is open .. all because it’s gassed – and so soon the product is exposed for normal air it starts compose. I always get the lettuce out of the bag so soon I home, rinse it under cold water .. let it drain of excess water and but it in air tight containers and you can have it up to a week. My romain lettuces after rinsed the head through I put in a bag and close it and it will last me for up to 10 days.